In Scotched in Scotland, the Three Stooges (Moe, Larry, and Shemp) are inept detectives, graduating with the lowest honors ever from their detective school. After the standard Three Stooges chaos (done very well, incidentally) the Stooges are sent to Glenheather Castle in Scotland, to investigate the theft of antiques. This leads to the bulk of the film, where the Stooges investigate the ‘haunted’ castle – it turns out that it’s the staff of the castle (including Three Stooges regular, Christine McIntyre, as “Lorna Doone”) who have been robbing their employer blind. The movie turns into a ‘haunted house’ movie, as the crooked staff tries to scare them away. 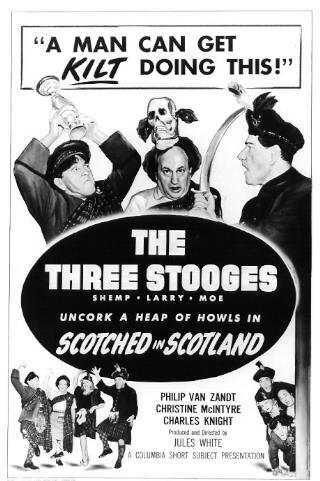 Scotched in Scotland is probably the best example of this type of Three Stooges short film, fast-paced and very funny. Christine McIntyre actually has a more ‘clownish’ role than normal – reaching into a safe only to get her hand caught in a mouse trap, accidentally being poked in the rear by a knife-wielding thief, etc. Other classic Three Stooges ‘haunted house’ bits include the ‘parrot in a skull’ routine (which is brief enough to be funny without becoming tedious), the bed that appears and disappears, etc. In short, Scotched in Scotland is one of my favorite Shemp-era Three Stooges short films, and I recommend it – I rate it a solid 4 clowns out of 5. 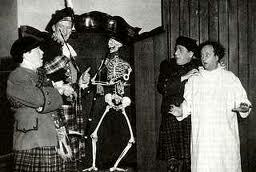 Scotched in Scotland is available on DVD as part of The Three Stooges DVD collection, volume 7. Dean Gonga: I’ve decided to give you boys your diplomas in private, ’cause you graduated with the lowest honors in our school’s history! Moe, Larry & Shemp: Gee thanks Dean Gonga, you’re a swell guy!! McShemp (Shemp Howard): Look at the size of this shack! McLarry (Larry Fine): Train leaving on track 4 — all aboard! McShemp (Shemp Howard): [in a kilt] Hey, Moe, is my slip showing? McMoe (Moe Howard): Meet McLarry, McShemp, and I’m McMoe. McShemp (Shemp Howard): Hiya, Mac! The Earl: Lads, my secretary! Lorna Doone (Christine McIntyre): Nice to know ye, laddies. McMoe (Moe Howard): A charming bit of thistledown if I do say so myself. McLarry (Larry Fine): And what might your name be, lass? Lorna Doone (Christine McIntyre):: Perhaps you’ve heard it — ’tis Lorna Doone. McShemp (Shemp Howard): Hi Lorna, how ya Doone? The Earl: Ye must be a bit weary after your long journey. The Earl: And what part of Scotland are you from? McMoe (Moe Howard): He’s from the southern part of Scotland, below the McMason-McDixon line. McShemp (Shemp Howard): When he said a sniff, he wasn’t kidding! The Earl: [offering the cork] Have another? McShemp (Shemp Howard): No thanks, I’m driving. The Earl: I want you to guard my valuables tonight, for I’m off to a gathering of the clan. McShemp (Shemp Howard): Oh, a clan bake, eh? McShemp (Shemp Howard): I feel kinda edgy myself; I ought to take something for my nerves. McMoe (Moe Howard): Like what? McShemp (Shemp Howard): A trip home. McShemp (Shemp Howard): [to Lorna Doone, caught red-handed] So that’s what ya been Doone, Lorna.